Here in the northern hemisphere the last day of summer is September 21st, which is tomorrow. I won't lie to you...I'm not a big fan of summer. Oh, I like it, but fall is my favorite. I love the colors, the cool temperatures, wearing just a sweater, apples, hot cider...you get the picture. Well, last weekend fall came early in our house. Out with the sea shelled mirror, the antique fishing basket and the green plant. 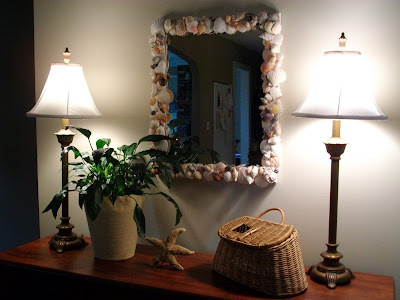 To make that mirror, I just took an old mirror, a boat load of shells and a lot of hot glue. See that basket that the plant is in...well, I want a sea grassy look, but couldn't find one, so that's an old lamp shade I turned upside down. and now autumn has arrived! I bought this little stitchery at a flea market for $3.00. Thought it was cute for this time of year. Here's a little hutch that I change out for the seasons. Crisp white for summer. Here is another sign that fall and winter are coming. This little chipmunk was cuter in person. Look at her in this pipe with a mouth full of acorns. Looks like me this weekend with all the junk I ate. (long story which I already told to the I Spy swappers in a letter, but the short story is... hubby and kids not home, I didn't cook, ate cookies, chips and dip and mac and cheese all day Saturday) Not pretty. I visited my sister-in-law today to see her 2 new kittens. I made her a Chocolate Chip Apple Cake. I'll post the recipe in a different post tonight. I also have 2 quick smore recipes too. Ok, Kelly (sisterhood of the junk food) if you are reading this, I just baked the goodies...I was very good, I just had one piece of cake when I was visiting her. I couldn't let her eat alone...wink, wink! 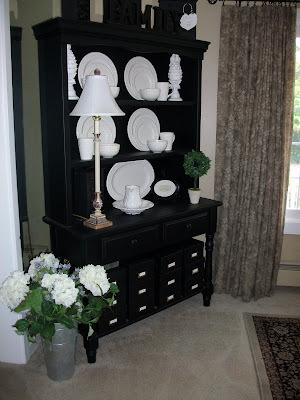 Lovely pics of your home! 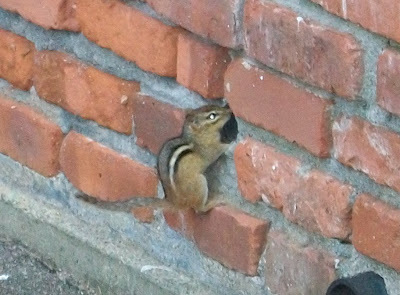 That's one busy little chipmunk! I'll be looking for that recipe before I take my son to school in the morning, so I can get what I need at the store and make it before picking him up in the afternoon. I don't even have to see it to know it will be delicious! 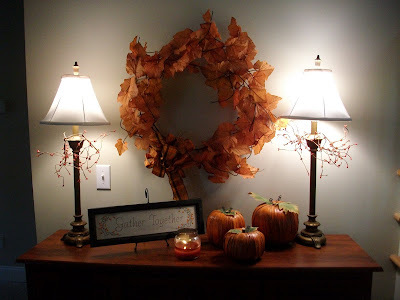 I love that you showed how you change areas in your home to accent the seasons! Wow Karen! I really love your seasonal furnishings! 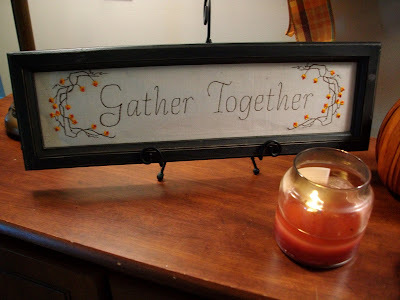 I particularly love the 'Family' sign on your dresser, the whole looks is stunning! 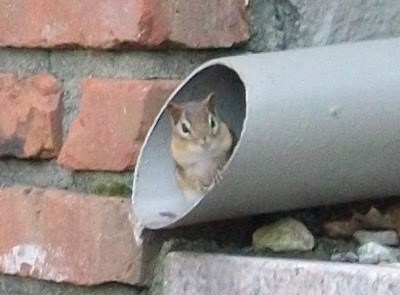 And how cute is that chipmunk?! I love your sea shell mirror! I will start collecting shells! I hear you about the junk food. I ate 2 bags of Jax (cheese puffs) in 2 days while Bill was away. At least they were on sale! 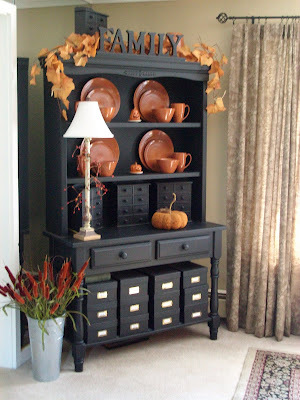 Fall decorating is on my to-do list for this week. I think just about everyone is in the mood for fall, at least in the Northern Hemisphere. I got out a couple fall quilts for display.